I went and looked at another little town not far from here- St Martin de Londres. This eglise was in the central part of the old village and the archways must once have formed part of the cloisters for the eglise. Unfortunately the church was not open. I imagine it muct be busy in summer but I saw hardly a soul as I walked around. I love these giant pans of paella that they have everywhere- this one I passed this morning at the market at St Gely du Fesc. It was very tempting but I only took a photo instead. This linocut is of the sarimanok- a symbol of good luck in the Southern Phillipines- I printed these panels to be used for my friends project she is working on in the Phillipines- the panels are of a size to make bags. This bird panel was inspired by a series of cards created by Wiener Werkstatte artist Ugo Zovetti- the form is the same but I have changed detail. I am pleased with both lino-cuts as I seem to be finally able to get finer detail into my lino-cutting- things do improve with practice!. I now have three birds all of the same size- maybe I shall make them into a little book. fabrics with circles as well. The dark fabric is an African print that my friend had- you cannot see it from the photos but it has just the right colour of turquoise in it- as my tree shapes are printed in turquoise colour bright from Trapsuutjies. And if you ar ein need of some adventure or a change of scene and pace- don't forget that Creative Arts Safaris is doing a tour of Syria from 15 to 28 May of this year. I will be one of the tour leaders- we almost have enough numbers but could do with one or two more. 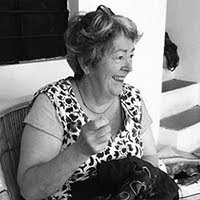 The idea is to be inspired and to create as well- we will be visiting lots of different textile inspired things as well as stitcihing with some refugee women.And we will creating your own versionj of a travellers blanket! These are two pieces of Kuba cloth- relatively recent as the raffia is not so finely woven and the embroidered detail is fairly loose. I love Kuba cloth for its simple repeated forms which seems to have a myriad of variations and its very abstract impression. Someone pointed out recently that kuba cloth is always about right angles- although the bottom cloth seems to have just some dots. The tie dyed raffia on the edge of the bottom piece as lovely! I may have to give up my desire to live in France- my youngest who is at school here is not likely to cut the grade with her French and is a langauage short as well ( apart from English they also do either Spanish or German in the middle years- it's actually quite a sad refflection on Australian education that we minimise langauages). it has left me in a quandary as to what now?? We will stay until at least June- that way she will have attended school here, picked up some french and not missed too much Australian school. I am also wondering about education in England? Any advice would be much appreciated. I can't believe it! I only ordered my threads from Aurifil on Monday and today they arrived. I tried to chose a palette of colours that I normally use in my work as i often get asked what colours I use- so it is interesting for myself to see as well, when i have to pare it down and chose a modest array of colours . These particular threads are the Mako cotton threads in 28 weight- they have a lovely sheen for cotton and I can't wait to see what they look like stitched. I have also been finishing some hand stitching projects- the one with the spotted leaf is for Laura Liebenberg's Colours of Africa project- yes I know I am late, but it is all hand sttiched. The second piece is for my contribution to the southern lands exhibition which will be shown in March in Germany and in May at the Europeen Centre du Patchwork at Salelles d'Aude. it too is entirley hand stitched on lutradur. I have been trying to collate all the names for the KISS project- but am struggling- so I ask if you registerd your interest could you please email me. The photos don't really do these little bags justice- they start as a square which is then quilted. the pink one is quilted by hand and the cream one has been quilted with Aurifil Lana thread ( this is pure wool thread- I like it a lot! )- and then you stitch the sides of the square and you sort of create triangular sides- then add straps and voila a bag. I like the shape of them and because my friend will be teaching them to women whose sewing skills vary, it is quite easy to construct and can be hand quilted. I am in the process of making myself one as well! Is there any other things that anyone would be interested in learning from me on-line? Just give me some ideas if you are and then I can put on the thinking cap and maybe devise a course! I don't know where the last week has gone.I suppose I have been organising bits and pieces. I forgot to bring any batting with me- which is proving a bit of a headache- as I am so used to using Matilda's Own and so happy with the product, that I am not sure what else to use. I could kick myself for not bringing any! I also came away with only hand stitching threads and as i have a number of things to make including a coloured version of the 72 MORE Ways Not to Stipple or Meander quilt for my upcoming book with Editions de Saxe I have been wondering what to do- thankfully Aurifil have come to rescue in the way of sponsorship- I am so grateful, as the collection of threads i had back home was at times called "enviable"- threads being an important element in the work I make. And I have made one or two bags this week- they are samples for my friend Liwanag's project for the women she is teaching in the Phillipines- hopefully I can show images in my next blog. And then there is getting familiar with your surroundings. 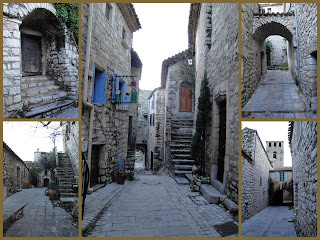 the collage is of a little village about 5 minutes form here called Les Matelles. The centre of the village is medieval and has wonderful stone buildings and lots of stone arches. The day i took the photographs the light wasn't too wonderful but I will go back another day and see if I can't do better.it is very tempting to go out this morning as it is foggy- which would lend a certain atmosphere! Ahh the day is beckoning- and today i really must do something in my paper journal- I had promised myself to improve my journal habits but that too has flown with time! The first image is the view from our bedroom window towards some of the rocky mountains/outcrops. You can still see hints of snow that fell yesterday.Sorry about the flywire- I will try and get better photos in the next few days! 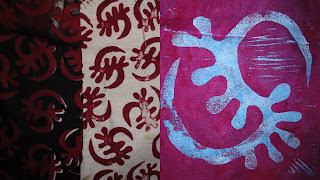 The second image is an adinkra symbol on printed cloth that my friend Liwanag had ( she lived in Sengal and Ivory Coast, so has many of the wax printed West African fabris)- the other half is a linocut I made of the symbol shape. Each of the adinkra symbols have a meaning- this one is called Gye Nyame- except for God and is a Ghanian symbol. The last image is of a rose lino-cut I made. I am not sure it looks like a rose really- it seems to also look like a peonie.There are stil places in my on-line linocutting course if you ar einterested- it starts on 25 January. I still haven't started working though the studio space downstairs is getting cleared! Slowly we are settling into life at Le Triadou! The above photos are of a reproduction fante cloth denoting the kings of Benin. it was hand made in benin in the traditional fante style. Fante cloths are flags made to commemorate kings and events. They ar ehand appliqued and embroidered. I also am unable to take any more takers for the Kiss project- it has tunred into quite a substantial project and if everyone delivers we will have plenty of things to exhibit and realy can't take any more. I am still taking registrations for my on-lino linocut courses. have just found a fabulours engraver from the eraly sixteenth century, Lucas de Leyde, in a 1966 catlogue of european engravings ( don't you love othe rpeople's bookshelves for the treasures they contain!) which has me all inspired again. 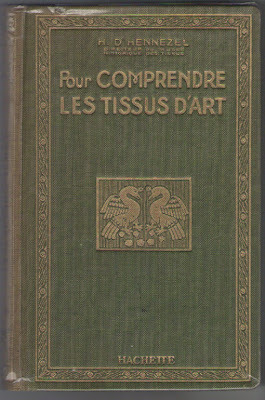 This is the cover of a 1930 book on Textiles given to me by my friend Christine Moulin.I love old textile books and even though the pictures are in black and white it often gives you good clues as to balance in the design of the textile. I am trying to get myself organised to get down to some serious work- the KISS challenge which now numbers over 50 participants and my next on-line Lino Cutting course which will commence on 25 January 2010. The course consists of 3 lessons with numerous exercises delivered at 2 week intervals with the idea of starting simply and developing more complex designs. The course has been geared for printing on fabric but the designs could equally be printed on paper. it takes you through the proces of creating a lino-cut, creating designs for lino-cut, using your photos to create prints and creating prints of more than one colour . The cost of the course is 40 Euros ( $56US) and I can be paid via paypal just email me! I will reply to eveyrone about the KISS project early in the new year and will give you more details. I think there there is a strong possibility that it will turn into an exhibition- so think your best creative thoughts about the project; I love the fact that people from all over the world have responded so it promises to be fun!!! I love the texture of wizened fruit that ripens on the tree, doesn't get eaten, doesn't get attacked by the insects, doesn't rot and there on the last day of the year, defiantly hangs by its stem in the tree with a texture unlike it's full fruity self, in colours so different to its summer glory and yet it is still beautiful. So Happy New Year everyone!!! !